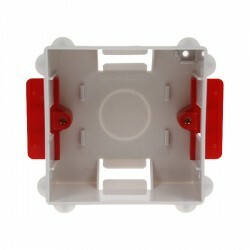 Click StudBox Universal 6-in-1 Combination Back Box with 380-450mm Centres at UK Electrical Supplies. If you want the fastest way to fix an electrical back box, check out StudBox (SB6IN1)! This ingenious electrical accessory offers an all-in-one solution for measuring, levelling, mounting, and more. 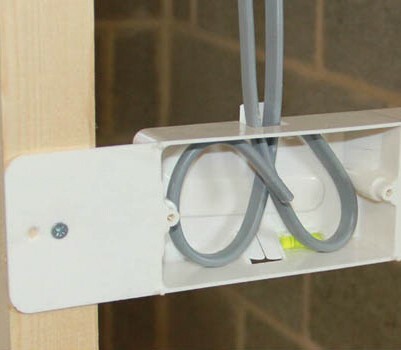 With a first fix you can finish in less than 30 seconds, it is no wonder StudBox was voted Top Product of 2014 by Professional Electrician and Installer! What distance will the box span across? The screw/nail holes are already moulded for 400mm and 450mm centres. However the box can also span small centres down to 380mm. What are the points for on the front face? When the plasterer places his board up to a wall with a StudBox fitted, he bangs the board in the area of StudBox and it leaves marks at the corners of each box cavity so the hole can been cut out exactly and without measurement being required. For a better idea of how easy it is for the plasterer take a look at this video of a plasterer using the Studbox to mark out where the box is. What happens if I only need to use a twin or single box? Cut the points off the box cavity/s not being used with snips and board over them. Why cut the points off the box cavities not being used? By snipping off the points on the unused box cavities this guarantees that the plasterer marks and cuts out the correct box cavity. Why does the StudBox have arrows in the back saying "single box" and "double box"? If you require another socket or switch at a later date the arrows show you which side to cut the hole in board. What happens if one of the brass threads gets damage? Drill out the damaged insert with a 5mm drill and we can supply a M3.5 brass insert that self taps from the front. Will StudBox break or shatter? No, StudBox is made from Polycarbonate an engineering plastic which means it's both strong and flexible. The flanges can be bent completely backwards and they won't break. StudBox is made from Polycarbonate which is described as a 'Self Extinguishing' material and has a fire rating of UL94 V-2 @1.6mm thick. Does the box push the plasterboard forward? The flanges are only 1.8mm thick so it is not noticeable when the board is in place. I notice the box is flexible when 1st fixed. This flexibility helps with any knocks or bangs it may receive. When 2nd fixed it is completely solid. Can you fit Grid switches and decorative sockets? Yes. 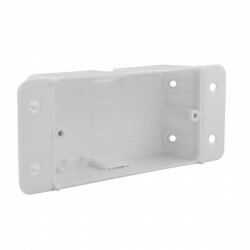 As sockets and switches from different manufactures are all slightly different in shape and size, when the plastered board is fitted the extra space allows the sockets to be moved into place.